Oh, la, la! We love French patio doors, do you? Originating in France in the 17th century, French doors were basically extended windows that went all the way to the floor and let out onto a balcony or garden area. They allowed more light into the home and evolved over time into one of the more decorative door options. French doors today typically feature a thicker, lower rail at the bottom and are offered in sliding or swinging styles. There can be anywhere from 1 to 4 panels and sidelights can also be added for additional lighting and venting. This image highlights a sliding French patio door with a colored exterior frame in the neutral tone of Tweed. The color is carried through to the outdoor seat cushions and exterior flooring. Turquoise accents add visual interest to the neutral color scheme, making this patio a relaxing place to entertain. See Essence Series® sliding patio doors. This den space gets its style from the beautiful, natural pine wood interior frame on the patio door as well as the matching windows. Valance grids were added at the top for a decorative and elegant touch. The light colored wood warms up the cool grays in the walls, curtains and flooring. 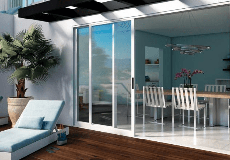 See Essence Series in-swing patio doors. Open concept living spaces are in demand for new construction and home remodeling projects. This room benefits from very high ceilings and an expansive wall of windows which frames the view. The perimeter grid pattern conveys a contemporary look, which is echoed through the interior décor. See UltraTM Series out-swing patio doors. This single panel, in-swing French patio door, offers traditional elegance. Colonial grids were used on the door panel and matching sidelight. The look was carried through to the two, side by side, single hung windows for a unified feeling. A cozy window seat was added making it easy to slip shoes on and off before heading out to the patio. See Tuscany® Series vinyl patio doors. We hope you are inspired by these four patio door options and you’ve gathered some design ideas on ways to add style to your space. Tell us your decorating tips in the comments below. The images you shared is very nice and looking classic. I am also thinking to install patio doors in my house. Could you please suggest me which one is best suited for my house?